The Bed and Breakfast “ Da Sabina” is an aeolian style house. It is situated in Santa Marina Salina, apart from the chaos of the inhabited centre, in a place called “barone”, less than 150 mts from the sea and more or less 10 minutes walk from the port of Santa Marina. 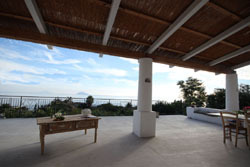 The house offers a wonderful seascape and a view of Stromboli and Panarea islands. At the disposal of the guests : cosy and comfortable double rooms with private bathroom, refrigerator and air conditioning. Each room has its own small terrace and a door opening on the hughe common seaview terrace where is served the classical italian breakfast together with fresh fruit and homemade jam. The days will be dedicated to sea excursions and walking tours to Mount Fossa or to the visit of the ethno-anthropological city Museum, a good way to know more about who we are.